A war is about to take place between Arachnotronic's badass Skylake build and my used to be badass but still sort of is Sandy-E build. Both builds have two 980TI's in SLI, both are pushing the same Acer XB270HU monitor @ 1440p/144hz and both CPU's are at 4.6ghz to make this a clock for clock battle. Both systems feature late model SSD's, although Arachnotronic is using very fast high end models. In any case, neither of us are IO bound as far as gaming is concerned so that shouldn't impact us in any real way. This is a fun opportunity for us to compare how similar high end systems perform with similar hardware with the only real difference being the CPU and platform. Once we figure out what to bench I expect we'll get started as time permits us to do so. Yeah it will be fun for sure. We know the Skylake is much faster, but what about all these new games people typically mention as benefitting from more than a quad core? Was the investment in HEDT worth it at all from a gaming perspective and how does it compare to yours? I'm looking forward to finding out for myself. I am willing to buy Just Cause 3 to bench it (and blow stuff up when I'm bored). I have quite a few older games as well but maybe we can start discussing with these. I have all of these apps/games! OK, so to make these results comparable we'll need to normalize our GPU clocks. What do you run your 980 TIs at? OK, we need to agree on which game to start with and agree on what settings to use and exactly where to go in the game. We can either try to replicate exactly what the other person does, or we can just record fraps info during the course of an entire level or mission and observe the comparative overall data. That would provide a good sense of min, max and average frames from both of us completing a mission or a portion of a mission. We can do it 3 times and take an average if necessary. We can do it like that or we can pick the same wall to stare at and report the FPS. The 3930k platform has only PCIe 2.0 correct?If so is there a good chance of some bottlenecks at resolutions like 1080p and lower? Would be quite interesting putting some 1080p numbers in there as well.Overkill sure for that resolution but give a good idea how much PCIe 2.0 holds back such a setup if at all. Its PCI-E 3.0 X16 for both cards. There is an activation patch that I had to use but the speed has been verified. This will be interesting.. Some team playing, online, together? I'll start with a simple Firestrike extreme run. I lost about 800 points by going to windows 10, but whatever. Here's the score. Nothing was OCed additionally for this test and I won't do that for any other test. I'm using my regular every day settings. I fixed my 3DMark score. I installed windows 10 clean and forgot to re enable PCI-E 3.0 :\ So I did and got another 500 points. 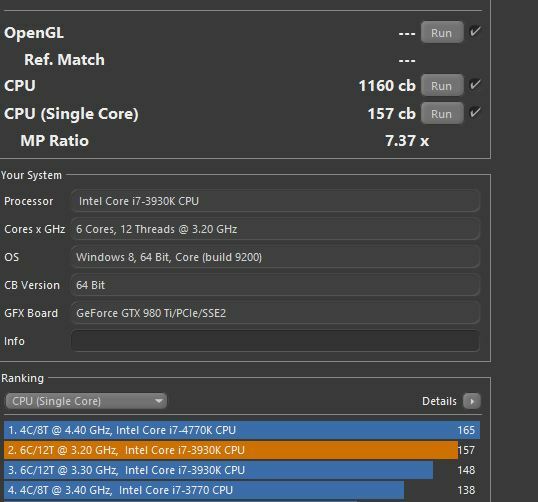 Cinebench R15 and heaven is included here. I showed Heaven settings from the menu and they are also shown on the results. 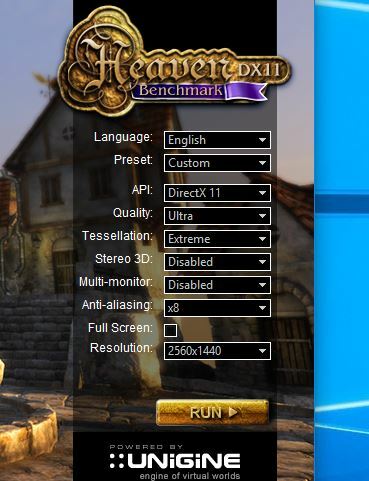 Heaven was ran full screen at 1440p even though that "full screen" checkbox wasn't ticked. I went full screen once inside. :thumbsup:Let the games begin! My 5960x rig is watching with anticipation! You just need to buy another 980Ti so you can play too. Arachnotrons and Spider Masterminds are cool. I am going to do a run of common benchmarks. I am going to include them in the post above and will add Heaven and Cinebench single and multi core results. This is to give us a baseline for comparison before diving into games. We want to make sure each of our rigs are performing like they should and are comparing like we know they should before doing something like benchmarking a game. We need to have at least some faith in the results and their consistency so a baseline is good I think. 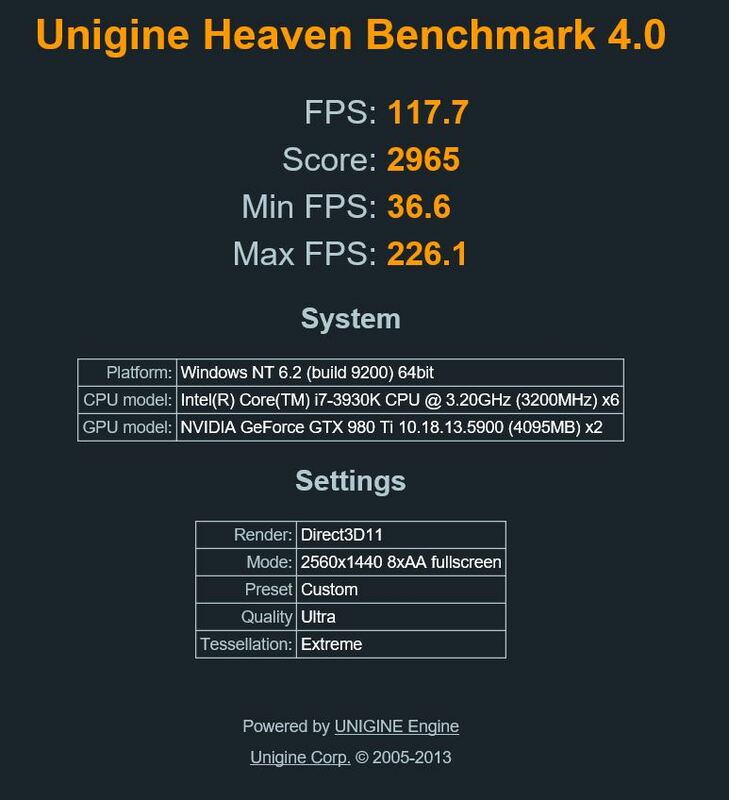 If you guys are going to use fraps on the Gaming benchmarks, please enable frametimes and post the results as well. But what sort of framerate do they get in Doom II? That's what I want to know! Says the guy with the Cyberdemon avatar. Waiting for Pascal to see what it brings to the table. Actually, it's too bad you only have two 290s. It would be really interesting to see what kind of differences you might see between your 5960X and 4790k, if they were both running the 290s. Specifically, if you were to run quadfire on each system. Depending on how big a step the launch of small die 16nm is, I'm considering trying to grab another 290 with waterblock from someone who is upgrading and waiting for big Pascal (or AI) to hit just for fun. Scaling would be interesting to see. All of the these games have built-in benchmarks, so it will make testing much easier. How good is the SoM benchmark? I find Tomb Raider to be reasonably consistent, but my results in SoM very wildly between runs even with background processes minimized.